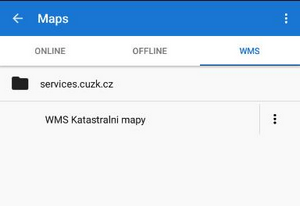 WMS (Web Map Service) is a standard protocol for serving georeferenced map images over the Internet that are generated by map servers using data from a GIS database. These are usually statistical maps that are mostly provided by government organizations (but also by many others). For more info, read this Wiki page. Locus Map offers a variety of worldwide sources that can be displayed or you can enter a direct URL to activate any WMS source you wish. 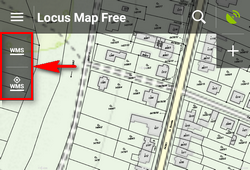 This option is fully available only to Locus Map Pro users. displays a list of recommended WMS sources. The best way how to begin with WMS. Just select and tap Add to Locus. launches a dialog to enter your WMS link manually. 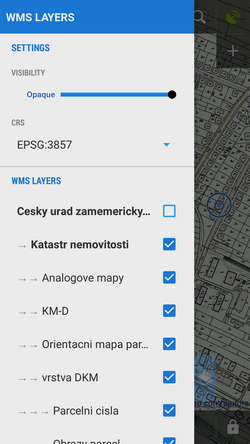 WMS maps display only as an overlay above your active map (online or offline), never as an individual layer. Select layers to display, adjust their visibility above the active map and confirm. Be aware that not all layers may be visible in all areas and in all zoom levels. 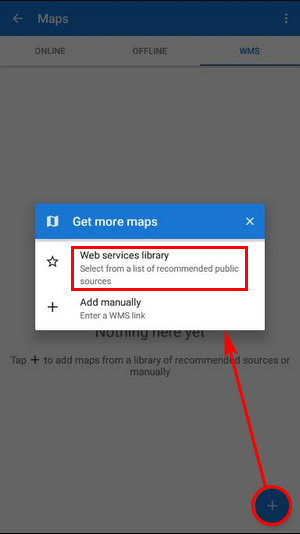 The WMS source appears in your Maps Manager WMS tab in a folder named by its provider. Long tap at a source displays an information window about the source provider, author, contacts, possible fees and further description. displays the opacity slider and active WMS layers list mentioned above - check or un-check layers to display or hide. Tap Add to Locus links directly in your phone web browser (access to this page is also from your Locus Map Manager WMS tab). Current WMS support does not have any mechanism for tile caching. All data are stored only in your device's temporary memory.